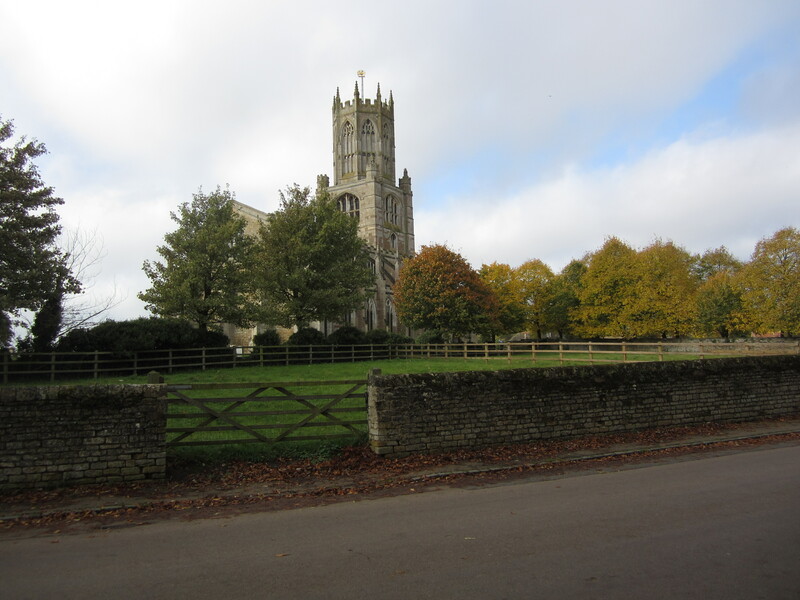 While visiting Fotheringhay Castle, the site of the execution of Mary Queen of Scots, we took a short walk down the road to St Mary the Virgin and All Saints Church in the village of Fotheringhay. While I knew the church was connected with the castle and the House of York, the building contained many fascinating features and was abundant with the history of the War of the Roses. Simon de St. Liz (Senlis), Earl of Huntingdon and Northampton began building a castle at Fotheringhay in the twelfth century on the north side of the River Nene. Several decades later, a Cluniac nunnery was founded just to the west of the castle. The nunnery later moved to Delapre. When Edmund Langely, fourth surviving son of King Edward III and first Duke of York took over the castle, he established a college of priests within the castle grounds with the express assignment of praying daily for the souls of himself and his family. It was known as “The Collegiate Church of the Annunciation and St. Edward the Confessor within the Castle of Fotheringhay”. With the death of Edmund in 1402, his son Edward inherited the castle. Following the wishes of his father, in 1411 the college was moved from the castle south of the river to the south side of an existing Norman church on the site of the former Cluniac nunnery. 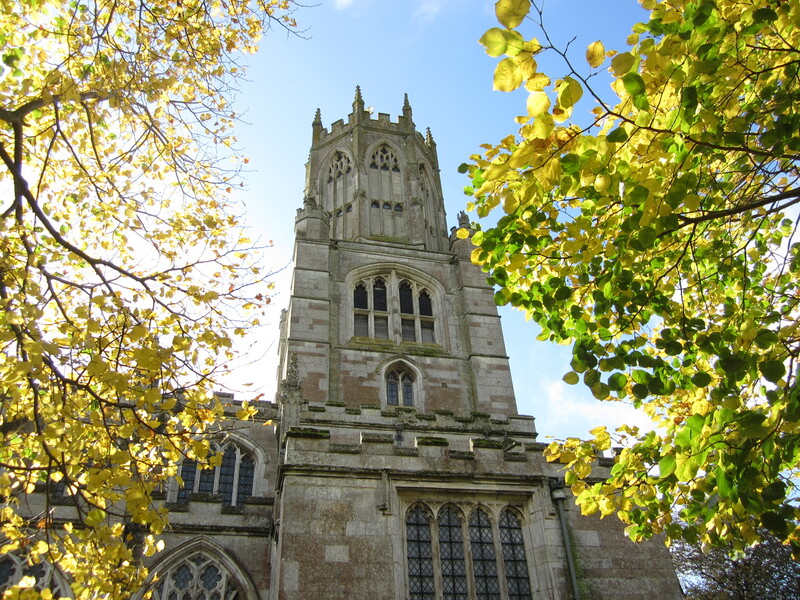 Starting in 1415, the chancel of the Norman church was reconstructed and extended to form the Quire and Lady Chapel of the Collegiate Church and the dedication of the foundation was changed to St Mary the Virgin and All Saints. That same year, Edward Langely was killed at the Battle of Agincourt. His body was brought back to Fotheringhay and buried in the partially built Quire and construction on the college came to a halt. Restoration of the college began in 1432 and in 1434 a charter was granted to Edward’s nephew, Richard, Duke of York to start a church. There is a record of the man who became the master mason on the building project. His name was William Horwood and the contract states Duke Richard would pay him £300 if his work was satisfactory. If his work was not adequate, he risked going to prison. The nave was rebuilt and extended to match the Quire and it remained in use as a parish church. Horwood immortalized himself in a carving on the nave wall with a humorous gargoyle. There are also grotesque carvings representing Horwood’s dog Blaster, Duke Richard, his wife Cecily Neville and a Green Man. The material used to build the church was limestone ashlar and the church was given a lead roof. The most arresting feature of the church is the Lantern and Tower. The tower contains a bell chamber. The Lantern at the top of the Tower used to be lit in medieval times to guide hunters returning home from Rockingham Forest. Inside the building, if you stand directly under the Tower and look up, you can see one of the most striking features of the church. 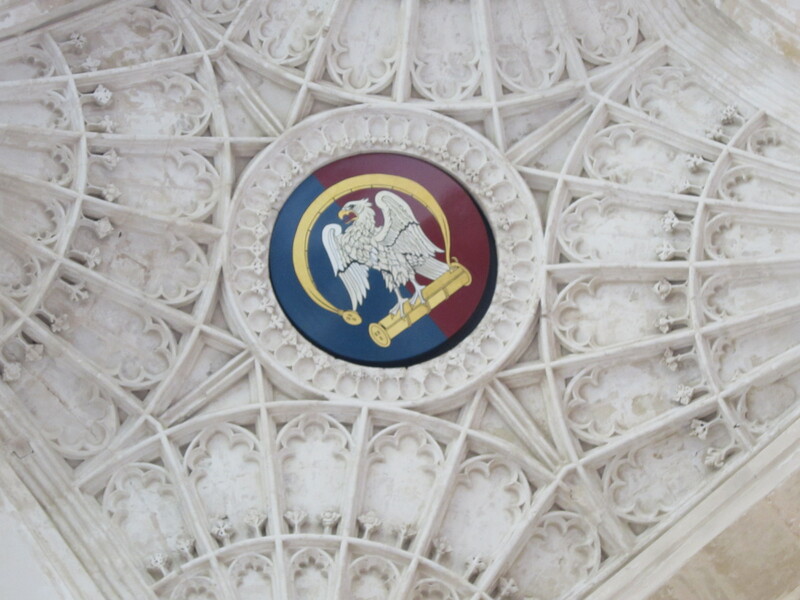 There is a beautiful fan vaulted ceiling and a modern painting of the Yorkist Falcon and Fetterlock symbol. “On 24 July  the bodies were exhumed, that of the Duke, “garbed in an ermine furred mantle and cap of maintenance, covered with a cloth of gold” lay in state under a hearse blazing with candles, guarded by an angel of silver, bearing a crown of gold as a reminder that by right the Duke had been a king. On its journey, Richard, Duke of Gloucester, with other lords and officers of arms, all dressed in mourning, followed the funeral chariot, drawn by six horses, with trappings of black, charged with the arms of France and England and preceded by a knight bearing the banner of the ducal arms. A magnificent chantry chapel was built over their remains in the Quire in 1477. When Cecily Neville, Duchess of York died on May 31, 1495, she was buried in the tomb with her husband and their son. The pulpit which can be seen today dates from the fifteenth century and it is believed King Edward IV donated it to the church. Richly carved and ornamented, it has been restored to its magnificent medieval colors. It is decorated with the arms of the house of Plantagenet and the symbols of the House of York; a white boar, white lion and black bull for the three Yorkist brothers, Richard III, Edward IV and George, Duke of Clarence. The college was dissolved in 1539 during the Dissolution of the Monasteries under the reign of King Henry VIII. Later the buildings were granted to Dudley, Duke of Northumberland and he had the chancel pulled down but left the nave as a parish church. The lead roof of the college cloister and the choir were taken down, leaving these areas to decay and eventually collapse. The bodies of the York family were moved to unmarked graves in the churchyard. In 1566, Queen Elizabeth I visited Fotheringhay and was disgusted at the lack of respect for the graves of her ancestors – her paternal grandmother was Elizabeth of York, King Edward IV’s eldest daughter. She ordered the remains be exhumed and reburied in the parish church with proper monuments. The tombs are of a typical Elizabethan, sixteenth century design. 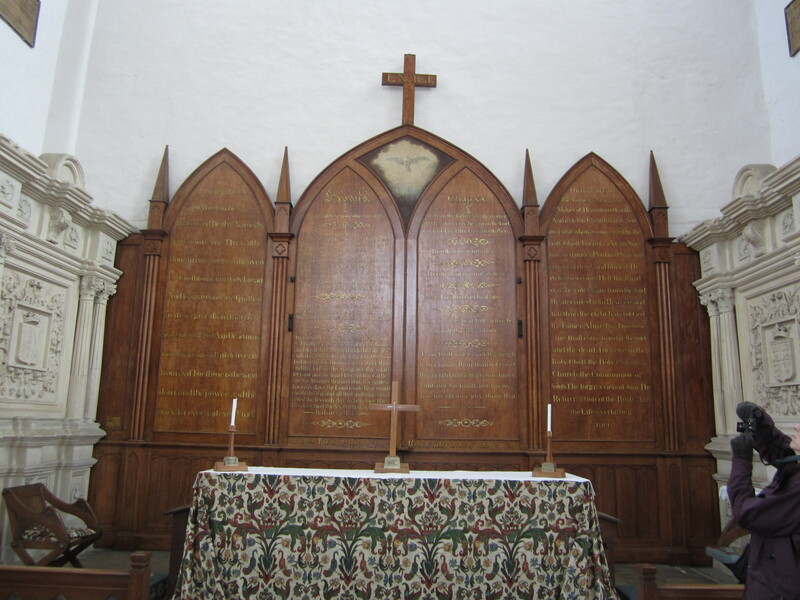 Other changes to the church have been made over the years including Georgian box pews which were added in 1804 and new stained glass windows decorated with coats of arms and symbols of people connected with the church. Over the east tower arch is a royal coat of arms for King George III dating from 1807. In the entry porch, above the door to the Treasury chamber is a small stone lion that came from Fotheringhay Castle. The Perpendicular architectural style is just beautiful and the church is filled with light from the many windows. Even for those who are not fans of the War of the Roses, this church is a medieval masterpiece. Fascinating and excellently written article; Fotheringhay has been on the ABAB ‘must visit’ list for some time. You will love it Mike. Very atmospheric. And you must visit what remains of the castle. It really feels like something momentous happened there. A couple of momentous things DID happen there 🙂 Yeah – the castle’s one I’m looking forward to, ruin or not! Her pictures are better than mine! LOL!! It’s a very nice post and the pulpit really is beautiful. There is a medieval rabbit warren close by, but with very limited public access. The scotch thistles that grow on the castle mound were allegedly sown by Mary Queen of Scots when she was a prisoner at Fotheringhay. Some years ago they were DNA tested to see if this may be true but I never discovered the results of the tests. There are quite a few Fotheringhay records held in the Westmorland Archive at Northamptonshire Records office. What a magnificent church! 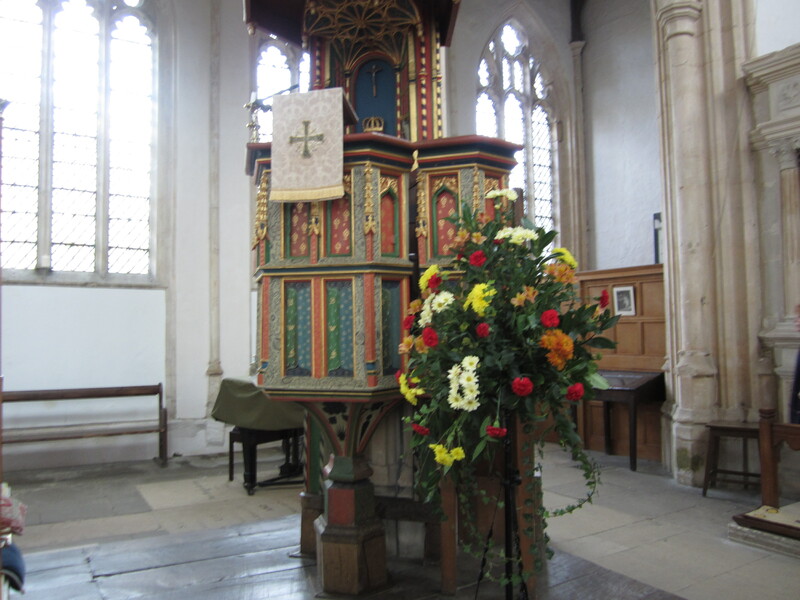 I especially loved the painted pulpit.